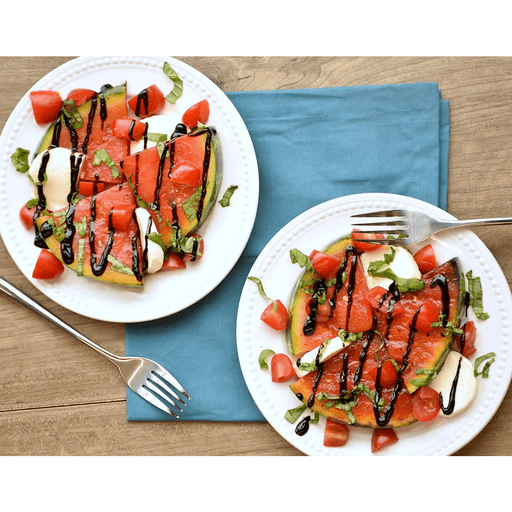 Try this fun twist on the classic Italian caprese salad! 1. Preheat grill to medium heat. Brush both sides of each watermelon triangle with olive oil and season all sides with salt and pepper. Add a drizzle of honey over each triangle and place them on the grill. Grill each side for about 2 minutes. Remove and add a little more honey, if desired. 1. Assemble salads by placing watermelon triangles on each plate, then cover with a sprinkle of tomatoes, mozzarella and basil leaves. Season with salt and pepper, then drizzle with balsamic reduction. Calories 230, Total Fat 13g (Saturated 5g, Trans 0g), Cholesterol 20mg, Sodium 340mg, Total Carbohydrate 22g (Dietary Fiber 1g, Sugars 19g), Protein 7g, Vitamin A 35%, Vitamin C 35%, Calcium 15%, Iron 4% *Nutritional values are an approximation. Actual nutritional values may vary due to preparation techniques, variations related to suppliers, regional and seasonal differences, or rounding.